So it’s been a little while since we’ve posted a new article to the site, but that doesn’t mean we’ve been idle. Much of our work is done via facebook and twitter. Social networking just lends itself to most of our tasks. If you’re not using facebook, you’re not getting the full picture of the Louligans. That said, we’re about to embark on a new season with the St. Louis Lions and some physcial networking. We started this season off last Saturday at Tigin Irish Pub. A little preseason get together to distribute our new scarves and have a few pints while discussing plans for the upcoming season. In addition to that, the St. Louis Lions sent a couple representatives (Michael and Beth) to take money for the Special St. Louligan Season Ticket Package. If you were one of the Louligans that bought a scarf you get to buy a Lions season ticket for $50. A specially designed pass with our Logo on it will be your ticket to our special section at Tony Glavin Soccer Complex this season. It’s not too late to get in on this deal- we have around 15 scarves left. I don’t know what the official total was, but we sold around 30 season tickets and there were several people that couldn’t make the event. I’m hoping we have over 50 official Louligans at the games and over the course of the season we make more friends and some of the people in the main stand join us. Also, I want everyone to promise to try and bring at least one newbie out to the park. Let’s build this movement! In addition to selling season tickets and handing out scarves, Jen Grant made sure that Tigin and the Louligans cemented their relationship. Resevered seating and drink specials will go a long way to earning our patronage. 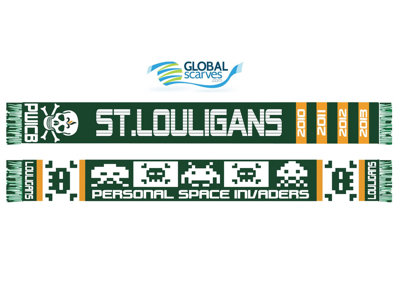 Also they are going to hang one of our new scarves up in the same corner with our shirt and an Eads Brigade Scarf and a Laclede’s Army Scarf. 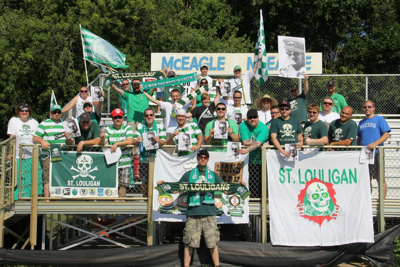 Tigin is proving themselves to be valuable allies in growing the sport of soccer in St. Louis. We also recorded a new podcast toward the end of the day, but it may forever remain on a harddrive- we’d had a few beers and the contents of that podcast were strange even by our standards. In the end we had some fun, met some new friends and just generally acted silly. That’s how we roll. Upcoming events include a few pre-season matches, a possible roadtrip to Iowa for the season opener on May 14th and the home opener May 22nd. All will be revealed in due time. Basically, follow us on twitter and facebook to ge kept in the loop on future get togethers. Big thanks to everyone that came out to the party this weekend and I can’t wait for the season to start.